Wow! September went by fast! hearing from these remarkable women! I'm excited to learn more from them. I should introduce myself too! Afterall, we have some new friends joining us! I have a cat named Binx. with me falling off my rocker a few times. But he is ever patient, loving and supportive. help me find my way again. To have light in my life again. He answered me in an amazing way! because He created me that way. amazing woman I now am. and live in their own Soulful Brilliance. And that was the start of this blog! the light you already have inside. The light Heavenly Father created you with. the person you are today. a support team, or a sisterhood. and gather your own sisterhood? you have gathered into your space! please feel free to start now! There is no deadline to have them finished! 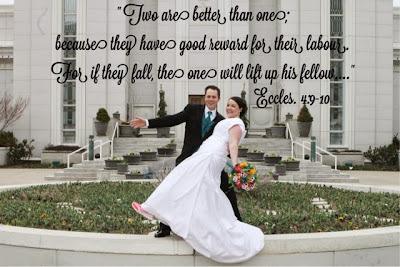 the one will lift up his fellow..."
and most especially in my marriage. and been lifted up by my husband. and remember my Soulful Brilliance. and I'm excited to learn more! October is going to be a treat! Hi my name is Kenzy. I am so excited to be part of this group and to learn from all of you beautiful women out there. I am 27 and a newlywed as of 9 months ago. The love of my life has been my best friend 9 years. We dated 6 ½ of the 8ish years before we got married, but we won’t go into right now because I’m supposed to give you a brief introduction and not the next Twilight series. Most of my life now revolves around my superhero husband and my two sweet dogs. Before that I was very much into sports and schooling. Both gave me very important lessons in life that I will expound on probably in the near future. It was shortly after high school that I found my sweetheart and found out what love really was. Eddy and I have been through some of the craziest adventures and some heartrending experiences. Both have brought us closer together with the help of a loving Father in Heaven. My husband’s family has a history of mental illness in his family and needless to say this apple, my sweet Eddy, did not fall far from the tree. I wouldn’t ask for him to be any different because I fell in love with him as he is and not who I wished him to be. I am blessed to stay home with my dog-children. I say that because they play, make messes, get dirty, snuggle and love like children do. As yes they talk. No I’m serious!!! Gypsy has sign language ears and Shadow uses her eyes and head tilt to let you know their opinion of life. After playing with these two, completing regular household fun stuff, and the unexpected, I love to go to my craft room and make quilts. I love taking fabrics of all varieties and bring them together to make something beautiful for others to enjoy. Megan: This lady is freaking awesome. Have you ever had one of those friends that somehow gets you to sign up for a crazy, farfetched half marathon, marathon, or worse… Ragnar? Megan unfortunately has a cousin that is that exact same way and it’s harder to dodge family. She and I have had wonderful talks as we trained for events and I can’t even begin to tell you how amazing she is. Megan is so in tune with the Spirit and has stood as a shining example every day of her life. Britt: Volleyball has been a big part of hers and my life. I was constantly amazed at the work ethic this chic had and I wanted to be just like her growing up. She taught me that no matter how hard it gets, you can dig deep and find a way to endure just a little more. Very very strong and talented right here folks. Beth: We are twins separated by mothers that are sisters. She and I share a love for horses, sports, cats, dogs, and most importantly…. ICE CREAM! You want someone who will be there for you through thick and thin? She is your girl. Very determined in all that she does and doesn’t give up too easily. I love being able to joke with this girl and she always brightens my day. Alyssa: This supermom is the bomb as well. She has more energy that an 82 year old that is for dang sure. I love that she is always there for her cute family and is always finding fun things to do with her girls and her husband. Alyssa’s laugh is so infectious that if we recorded it and played it through the satellites, then everyone would be happy in the world. She has a huge heart and you will get to see that here as we go along. Nancy: This woman is the boss, bee’s knees, cats meow, and all the other catchy sayings that I can’t think of right now. Talk about a humble, spiritual giant! The things you could learn from her are endless. She loves lighthouses and she has definitely been a lighthouse in my life when some storms came in and I was having a hard time finding the way to safe harbors. Her testimony shines so brightly, and the love she carries with it is unstoppable. So challenge for this week is to pick a 1 day a week, biweekly, or month that you can consistently give 10 minutes of your time to write down the people that are shining examples to you and why. Then pick one attribute that you want to work on and tell your support team so they can make you accountable. You can do it! It's been a long time since I've been an active part of this beautiful blog, but I'm ready to try and start fresh. We've seen some really amazing posts with the new design, and I can hardly wait to share my thoughts with you on my powerhouse support team. I hope that your support teams are coming together to bring out the brilliance in each of you. Since I last wrote, my life has changed quite a lot. I am turning 25 in just a few short months. I have graduated from SUU with a BIS in Agriculture. 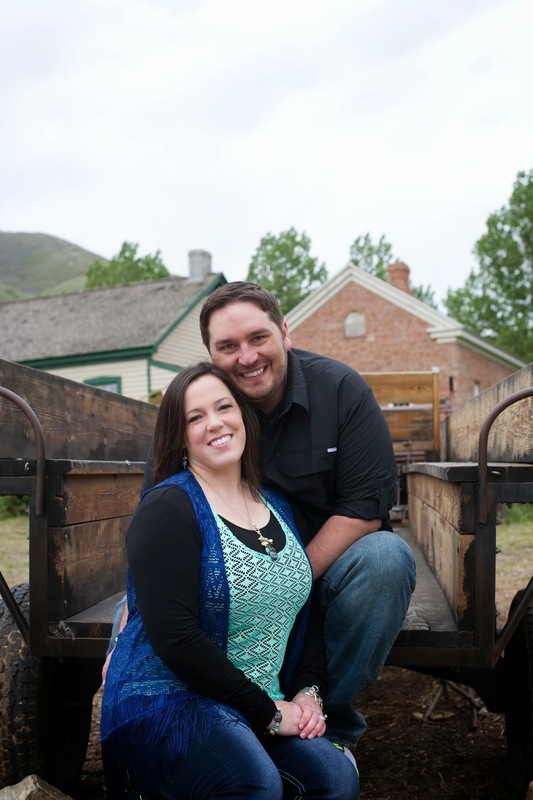 I've moved back to Northern Utah, and am trying to figure out the next step in my wonderful journey. I am a horse fanatic, and still enjoy all the time that I can get with these truly amazing creatures. Some of my most profound life lessons have come from working with them. I also enjoy the outdoors, whether it be hiking, fishing, or whatever. I am also very athletic, and especially love volleyball. I also enjoy coaching now that my playing time is limited. I have also have a new found love for genealogy work, and do what I can when I can. Megan: A great older sister. She's a great example of patience and love. It's not easy letting your little sister be a tag along for several years. When I had no friends to spend my time with though, I knew I could count her as a true friend. Brittnee: I have always looked up to Britt. She is a great example of how to push through hard times, and strive to do your best. Her example of strength helped me find my own. Kenzy: We share a passion for horses, and it was her that introduced me to working with them. She is amazing at seeing the little details that are important and lead to greater understanding of things. Alyssa: My awesome sister-in-law is just as awesome as super woman, even though she is too humble to admit to it ;) It has been a true blessing to feel of her testimony and see how to brighten it through sharing. She is also a great example to me of how to be a great mom. Nancy (a.k.a. mom): Thanks to her constant love, support, and hardwork, I have grown up with a knowledge that I am a daughter of a loving Heavenly Father. Her testimony has also helped strengthen me and been a light in the dark times in my life. She is a great example of living what you believe and sharing the light you have. I have only included a few short things about these amazing sisters, as you will get to find out more of their amazingness for yourselves as we continue on this journey together. My challenge to you this week, is that you find a picture of a brilliant light (sun, a star, a lightbulb, etc) and set it as the wallpaper for your cellphone, computer, or whatever device you use on a daily basis (and post it to instagram #soulfulbsisterhood) for one week. Picture yourself and those of your support team in this light as individuals, then all together. Record in a journal or somewhere your thoughts and feelings, and then comment on the blog and facebook about what impressions you felt. Hi everyone, another member of the Soulful B Sisterhood... I'm Alyssa Dean said "A-Lisa"... trust me my name has been a struggle my entire life... sigh. I happen to be 28 years old- going on 82, yes 82. 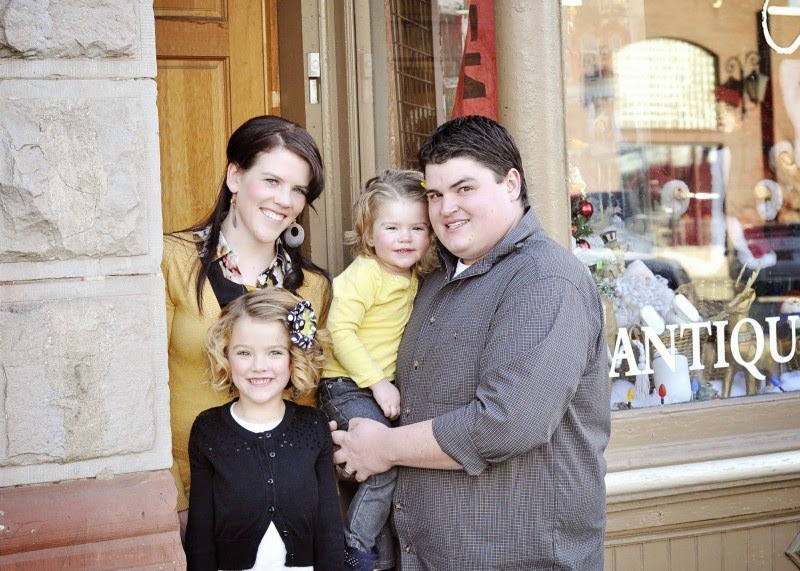 I married my high school sweetheart Brian in September of 2005, and he also happens to be Megan's loving brother. I have two of the most precious, crazy, dramatic, challenging, and loving little girls. I work full-time graveyard shift 5 nights a week as a Registered Nurse and Full-Time as a mother 24-7. My husband is going to school full time to be a high school teacher and working part time as a pharmacy technician which equals him being gone- all the time. All of this means I sleep very little, but I see it as a beautiful blessing from my Heavenly Father (most of the time) and when you read my posts, you'll understand why. In all my spare time (belly laugh), I enjoy baking for people, crocheting blankets, remodeling anything that I can find (and my husband will let me), organizing, blogging my family's life, cuddling, and napping- yes napping. I believe you can never write enough thank you notes, and stamps hold a special place in my heart. I was certainly blessed with a love for the elderly-I could just adopt every old person I see. I happen to enjoy yard work, cooking, and cleaning... Just don't make me do the dishes- yuck! People would tell you I am one those super women who can do everything- without tired bags under my eyes and while smiling. It's a lie. We all know it.Truth is I am an amazingly happy, capable, and blessed Daughter of God- not because my life is without challenges or because I don't require sleep, but because I so often choose to focus on the blessings that surround me. I chose to put the most important things first. Even though the struggles are real, I believe you can too. I am excited to share my testimony of the beautiful Daughter of God you are, of the light that our Heavenly Father place inside you, and joy that He desires you to feel each and everyday. This is going to be BRILLIANT! At this moment, its 5 am. It’s not unusual for me to be awake on the computer at 5am, after all, I work the graveyard shift. What IS unusual is the excitement I feel at being able to be a part of the Soulful Brilliance Team and the hope I have that as I share my testimony that it will somehow inspire you. A simple quote sums up my feelings of why I chose to join the soulful brilliance team. Marriane Williamson said, "Our deepest fear is not that we are inadequate. Our deepest fear is that we are powerful beyond measure. It is our light, not our darkness that most frightens us. We ask ourselves, Who am I to be brilliant, gorgeous, talented, and fabulous? Actually, who are you not to be? You are a child of God. Your playing small does not serve the world. There is nothing enlightened about shrinking so that other people will not feel insecure around you. We are all meant to shine, as children do. We were born to make manifest the glory of God that is within us. It is not just in some of us; it is in everyone and as we let our own light shine, we unconsciously give others permission to do the same. As we are liberated from our own fear, our presence automatically liberates others." The women who will be writing on this blog are powerful beyond measure, we are gorgeous, talented, and fabulous women of god- JUST LIKE YOU! When we try to down play our great gifts and power, when we shrink or play small, we are only allowing Satan to first control our thoughts of inadequacy and second stop the light Heavenly Father has placed within us from reaching others. In other words... we let Satan win. You might feel like you don't have any light within you, perhaps you truly don't feel gorgeous, talented and fabulous. Maybe you feel let down, unrewarded for your efforts, lost and alone. It is my testimony that our Father in Heaven made you, he doesn't make junk! He makes beautiful Daughters of God with special talents and abilities. Within you he has placed light. He loves you, he desires for you to be happy. He desires for you to feel full of light and brilliance, and it is my testimony that this is the reason he inspired the women of the Soulful Brilliance Sisterhood to share their testimonies, life experiences, and light with you... Welcome to our blog, we hope you'll stay. Challenge: Hang up Marianne Williamson's quote on your bathroom mirror, REMEMBER you are powerful beyond measure. Invite 3 of your family members, friends, co workers to read this blog and join us at #soulfulbsisterhood and www.soulfulbrilliance.blogspot.com . Hi, I’ve been racking my brain as to how this is “supposed” to look all week. Here it is my week and my thoughts have not come together the way I thought they were “supposed” too. Who is this blog for? I would like to say any of you women out there with the idea that things have to look a certain way and if they don’t then something has gone askew in the universe. That if you aren’t the “supermom” that you think you “need” to be. If you’re 31, 25, or any other age unmarried and wondering what have I done or not done to have a significant other in my life to fill that other “better half”(for lack of a better word). Maybe marriage has come your way and the “ideal relationships” seems to be someone else's fortune. This blog is for all of us looking for comfort in the imperfections of this mortal life and the perfection of a loving Heavenly Father (I choose that name for the knowledge I have gained and the extreme love I have for a higher power, the Universe, Energy, light, and any other name that encompass Him). I’ve been a part of soulful brilliance from its beginning. I can’t say I’ve taken the active roll in spreading the brilliance (I can count on one hand my blog posts). I was struggling with how I wanted it to look or who I wanted it to influence. While Meg took the reigns and had a more clear vision in her mind of what she desired it to look like and who it would influence. I felt a tug at my heart and a burning desire has come into my vision to share with all women any age, race and even religion. We are all powerful spirits here to serve and lift each other. I have such a great love for all of my sisters and I look forward to expanding my knowledge and sisterhood here in the soulFULL brilliance. I’m blessed to be working with some very soulful sisters of light. Meg is full of light and truth a spiritual giant. She has a love for teaching especially assisting others in seeing their soulful brilliance. Beth the youngest of this group of sisters, but so full of love a true peacemaker. Nancy shares her beautiful light through her example of faith. I’ve learned so much from observing her. She has taught me how to love and surrender to the will of the Lord and how to release judgment and just love. Alyssa is so dynamic. She flows through life with such passion and brilliance. She blesses so many lives with her light and love. Kenzy is so genuine in loving and accepting others where ever their path has taken them. We have gathered to share our journeys to soulful brilliance and to continue growing together in the soulful sisterhood. I’m so blessed to have such a large sisterhood (support team if you will).Who’s in your sisterhood? Why have you chosen them to be a part of your life? We are all on this journey together. Our sisterhood is always expanding and changing as trials and challenges come into our life or the flow of constant change swoops us into a new chapter of life. People are placed in our path to shape and mold us along our perfect path. please share with us some of your journey to soulful brilliance what is it for you and how does your soulfully brilliant sisterhood assist you in shaping your path. Challenge: this month it's to gather your sisterhood. Take the time to write about it in a journal and then test your nominations do these people truly fill your soul with brilliant light? A few places that I've found brilliant sisters is in my family and by gaining friends through work, my ward/church group, and neighborhood. Who do you choose to share your soulful brilliance with? I look forward to this journey of growth and expansion in my soulful sisterhood. 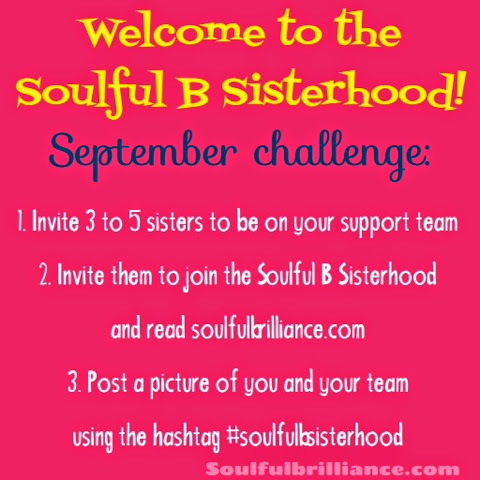 Welcome to the Soulful B Sisterhood! Dear sweet friends! I'm so excited for the chance to introduce you to something new! This summer has been an eye opener for me. I've been reminded of some things. I've had the opportunity to shift some things. One of my big shifts is on this blog. and at times we face challenges that seem insurmountable. created all living things to support each other. to preach to the people. He is rejected and leaves. don't repent the Lord will destroy them. who feeds him and gives him a place to stay. with him to preach to the people. He was Alma's support team! Inside those organizations we have more support! Each of them has been a light for me. when I couldn't see it. They are just ordinary women like you and me. I watch them doing quiet acts of service for others. Each of us comes from a different stage in life. Some of us are newlyweds. Some of us are married with young children. with grown children and sweet grandchildren. and trusting in the Lord. they will all be joining us here on Soulful Brilliance! for me throughout my life. She taught me how to ride a bike. She taught me about vision. example to me of always believing in yourself. Beth also has been a part of the team for awhile. She is the most amazing sister ever! I have always loved her peacemaker personality. challenges and believing in your dreams! She is an amazing example of patience and perseverance. a little over three years ago. and Kenzy just kept plugging on down the road. She lives her life doing that same thing each day. to have her with us. of charity and supporting others! in my success in life. to work on together throughout the month! along with a small challenge to help you during the week. Please comment on posts and share your stories! on Facebook and Instagram to share! and challenge from the sisters. to help and lift each other. that we may all sit down in heaven together." has been an amazing support in my life. some amazing daughters of God. a part of your support team. and in your ward RELIEF SOCIETY!